Visitors sense pride as young professionals work on the first Palestinian city built with a master plan and the first new Palestinian city to rise up among the scattered Israeli settlements in the West Bank. Many of her young Christian contemporaries are coming to buy apartments here, said Khoury, who is in the process of choosing an apartment for herself. Co-worker Jack Nasser, 28, a Catholic who lives in Ramallah and works as office manager on the project, has already bought an apartment here and convinced his brother and one sister to buy here as well. What was envisioned as a neighborhood has transformed into an entire planned city. Rawabi will have an upscale city center with shops, offices, restaurants and apartments surrounding a central plaza. Developers hope to attract internationally known brands as well as high-tech companies to provide employment for residents. The West Bank cities of Ramallah, Nablus and Jenin are all overcrowded and Rawabi, which means “hills” in Arabic, can provide an answer to companies looking for space or to expand, said Khoury. The city’s 20,000-seat outdoor amphitheater is nearing completion. It will have an 800-seat indoor theater, a convention center, three cinemas, a soccer pitch, three schools — one for boys, one for girls and a co-ed school — in the initial phases, with five more schools planned for the future. Rawabi was the brain child of Palestinian businessman Bashar Masri, who was educated in the United States and Egypt. “I never had a doubt in my mind from day one that this was right and that one day it would be a great success. 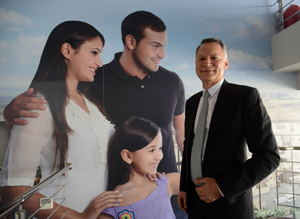 Today, the project is much bigger than I ever imagined, and it is getting bigger,” Masri said. The Rawabi showroom includes a museum-quality mock “walkthrough” model of the city at its entrance and a 3-D introductory movie of the project scripted by an international company. 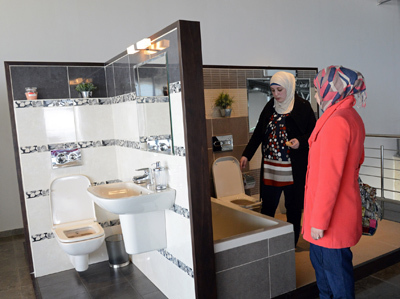 It also has computerized models of the various buildings and apartment styles so prospective buyers can check out the availability of different options using iPads programmed with special software by a Palestinian company in Nablus. Masri said he tries to use as much Palestinian labor as he can. Qatar is footing almost two-thirds of the budget through the Bayti Real Estate Investment Co.
Masri lives in Ramallah with his American-born wife — both daughters are at universities in the United States — and he said he has no plans to move to Rawabi. But his company has sold between one and nine apartments a day since opening up sales in mid-May, he said. The initial budget for the project was $500 million. Today the project stands at a budget of more than $1 billion and will eventually include 23 neighborhoods with some 6,000 housing units for 30,000 residents. The first 600 apartments are scheduled to be completed early next year. Future stages of the project will include some higher-end single-family homes as well as one-bedroom apartments for young couples and students, Nasser said. A mosque is being constructed, and in February a cornerstone-laying ceremony was held with Greek Orthodox Patriarch Theophilos III for the future Greek Orthodox church to be built. A spot has been reserved for a Catholic church. Father Humam Khzouz, general administrator of Jerusalem’s Latin Patriarchate, said the patriarchate is interested in building a church and school in the new city and is in the process of reviewing several options. In addition to conveying a message that Palestinians are capable of creating something bigger than what they have had, even with the Israeli occupation, Masri said he wants to convey the importance of creating the reflection of a tolerant Palestinian society in Rawabi. Palestinians want a secular democratic state, he said, and he believes that a tolerant Rawabi will be another step in that direction. The same was not done with the mosque, he noted. Christians make up less than 2 percent of the predominantly Muslim West Bank. 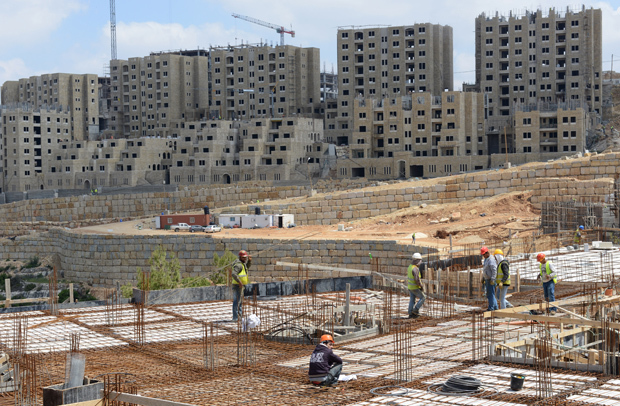 Rawabi prices are affordable compared to Ramallah, where property is at a premium, said Nasser. “Instead of immigrating for a better quality of life, they can have it here. They can have a better quality of life and still be in Palestine,” said Nasser, who noted that when his sister came back from the United States with her family, the first thing she did was purchase an apartment in Rawabi.